KFI employs an ecosystemic and participatory approach in all its programs and activities. General activities include nest protection scheme or wardening scheme, capacity building, protected area management, among others. Conservation education encompasses all its activities. 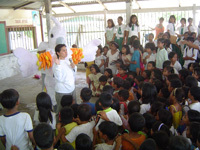 Species conservation program aimed to conserve the Philippine cockatoo from extinction through, e.g. nest protection, identification, protection and management of key conservation sites, habitat restoration, conservation education, community involvement, rescue of individual birds, translocation, conservation breeding for later re-introduction, etc. Project sites include Narra, Dumaran and Rizal in Palawan Island and Polillo in Polillo Island. The newest site, Pandanan in Balabac, Palawan is co-sponsored by the LPF and its funding partners and the Wildlife Without Borders-Criticially Endangered Animals Conservation Fund of the US Fish and Wildlife Service. 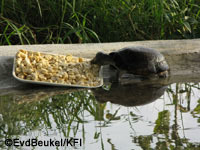 The MOA between KFI and PAWB-DENR on the Philippine Freshwater Turtle Conservation Program was signed in November 2006. This joint undertaking aims to conserve Philippine freshwater turtle populations and habitats, to conduct scientific research on biology and management of these turtles and its habitats and to educate and capacitate stakeholders for its conservation. Through the KIEBC at Narra, these objectives are hoped to be met. This MOA provides the legal basis to obtain confiscated turtles from recognized rescue centers and/or to accommodate otherwise rescued turtles to the center. Current activities give special attention to the critically endangered Philippine forest turtle Siebenrockiella leytensis and were sponsored by the European Association of Zoos and Aquaria (EAZA) Shellshock Campaign and the Turtle Conservation Fund (TCF). The overall goal of KIEBC is conserving Palawan’s biodiversity through establishment of an education, conservation and research institution in close vicinity to threatened target species and ecosystems. Its specific objectives are: 1) To serve as a venue for conservation education with local population, youth, national and international visitors as main target groups. 2) To develop protocols for rescue, conservation breeding, habitat restoration, and eventually reintroduction of selected highly threatened wild species of Palawan, like Philippine cockatoo or Philippine freshwater turtle. 3) To create an institution for research on applied ecology and biodiversity conservation, with focus on threatened species management, priority area conservation, and restoration. 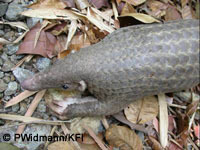 KFI is conducting research on the Palawan pangolin Manis culionensis. 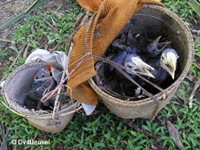 An initial study on the trade of the species in Southern Palawan was conducted in collaboration with TRAFFIC Southeast Asia. Results were presented during an international workshop on trade and conservation of pangolins native to South and Southeast Asia sponsored by Wildlife Reserves Singapore. This was the starting point for two new projects: 1) the “Phylogeny and Taxonomic Status of the Palawan Pangolin” a joint endeavor between KFI and the Comparative Biogeographic and Conservation of Philippine Vertebrates (CBCPV) Project of the Biodiversity Institute of the Natural History Museum and Biodiversity Research Center (KU-BRC), and the Laboratory of Genomic Diversity (LGD) of the National Cancer Institute (NCI) in Maryland. 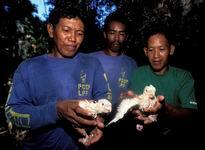 2) "Conservation Status of the Palawan pangolin Manis culionensis. This project was just submitted for funding and aims to start in 2009. The objective of the project is to establish a sustainable cockatoo population in selected translocation site, and specifically: (1) to identify and assess suitable translocation sites; (2) to document the translocation process (3) to create conditions suitable for the long-term survival and establishment of a sustainable cockatoo population. A translocation protocol is envisioned to be developed along with project partners. For reports on the first translocation attempts, please contact Indira Dayang Lacerna-Widmann. This project focuses on the protection and rehabilitation of former or existing tropical forest areas with the aim of sequestering carbon and of creating or preserving habitats of threatened wildlife species in the Philippines. KFI enters into long-term agreements with local communities in order to facilitate rehabilitation of degraded or long-term persistence of existing forests in the Philippines in mutual agreement with the donor. Project approaches include: a) Selection of suitable areas based on the potential for carbon sequestration or the actual carbon stock and the value for biodiversity conservation; b) Management of the acquired areas; c) Acquisition of mature forests – in case the forests are in danger of conversion or degradation in a short or middle term (“avoided deforestation”); d) Monitoring of acquired areas; e) Forest inventories after the intervention to assess standing crop and therefore carbon in the living biomass; d) Assessment of selected groups of plants and animals with focus on occurrence of threatened species. Initial project duration is five years, starting from January 2009 to December 2013. The Southern Palawan Anti-Poaching Initiative (SPAPI) focuses on one of the most important source areas for illegal wildlife trade in Palawan. 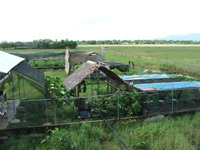 The strategy follows the successful examples of cockatoo conservation in Rasa and Dumaran Island. Its main purpose is the conservation of threatened wildlife in the Municipality of Rizal from extinction, through addressing poachers, law enforcers, traders and buyers, youth and other key players; thereby capacitating and motivating these local partners to sustainably manage and conserve wildlife and their critical habitats in Culasian, Rizal. The conservation outcomes of this initiative are: (1) stable or increasing populations of the following species threatened by poaching: Philippine cockatoo Cacatua haematuropygia (Critically endangered); Blue-naped parrot Tanygnathus lucionensis (Lower Risk- Near Threatened, but declining rapidly); Blue-headed racquet-tail Prioniturus platenae (Vulnerable); Palawan peacock-pheasant Polyplectron napoleonis (Vulnerable); Palawan hornbill Anthracoceros marchei (Vulnerable); Palawan hill myna Gracula religiosa palawanensis (Subspecies, not assessed in Red Data Book, but declining rapidly); Palawan bearded pig Sus ahoenobarbus (Vulnerable); (2) 80% of threatened individual host trees serving as nest trees for poached wildlife are left intact: Koompassia excelsa (Lower risk – Conservation dependent); Intsia bijuga (Vulnerable); Dipterocarpus grandiflorus (Critically endangered); Dipterocarpus hasseltii (Critically endangered); (3) Culasian Managed Resource Protected Area is established and managed locally. 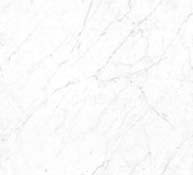 For a copy of Final Report, please contact Peter Widmann. A conservation education program which uses marketing methodologies to galvanize community support for conservation. This uses the Philippine cockatoo as flagship species which cultivates and promotes pride among local partners. Proven marketing vehicles like billboards, posters, fact sheets, puppet shows, school and community visits, festivals are used to deliver relevant and compelling conservation messages. For a copy of Final Report, please contact Indira Dayang Lacerna-Widmann. 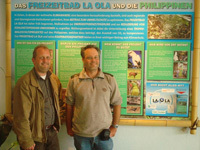 KFI’s Katala Quest expedition in Northern Palawan, Philippines bagged the Silver Award from the British Petroleum (BP) Conservation Programme in 2003 along with 32 other winning projects among 360 applicants all over the world! The flagship species of the expedition was the critically endangered Philippine cockatoo Cacatua haematuropygia, an endemic to the island nation. As few as 1,000 individuals may be left in the wild (Widmann 2001). 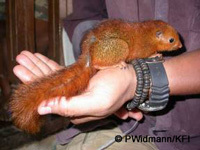 The island of Palawan is the last stronghold of the species. However, information on the species from northern Palawan was incomplete, or by now almost fifteen years old (Lambert 1994). Lowland forest types, which serve as cockatoo habitats in Palawan were systematically studied for their vertebrate communities, some of which are also listed as globally threatened. We conducted in-depth assessment of terrestrial vertebrate communities (small mammals, bats, birds, reptiles and amphibians) particularly in coastal, swamp, and riparian forest.